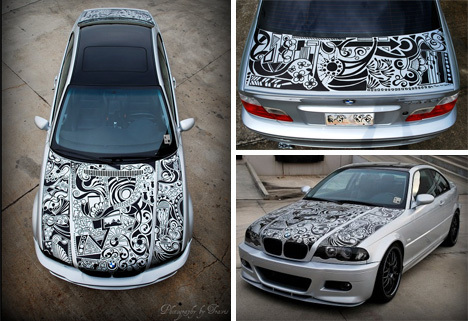 Not content to have a standard BMW, artist Travis Todd took a similar approach: he covered the hood and trunk with custom Sharpie art. 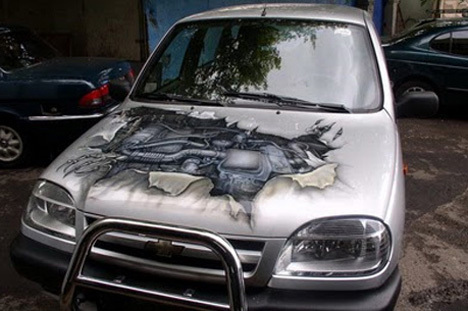 Sadly, the car was vandalized not long after the art was completed, but at least we have these drool-worthy photos to ogle. 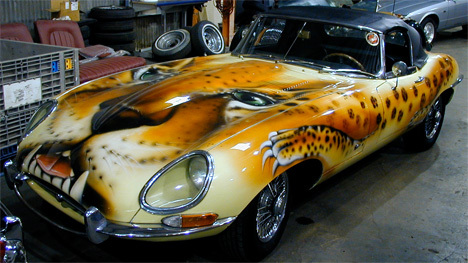 Taking us from stylish to head-scratchingly tacky is this abomination of a Jaguar E-type. According to the owner, it was the third of its line to be imported to the US, so the dealer who imported it (in 1961) decided to give it a promotional paint job. Despite its horrifically ugly paint job, the Jag seems to be in top condition. Then again, that’s probably because no one would be seen driving it. Cars are often used for promotional purposes, and not just for dealerships. 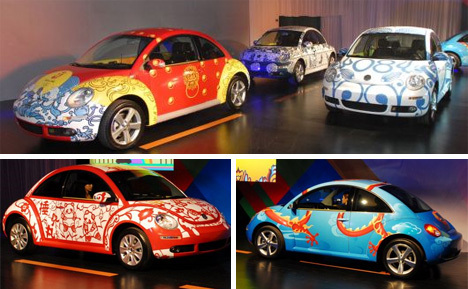 These Volkswagens were given crisp, eye-catching paint jobs to promote the 2008 Beijing Olympics. They traveled to VW dealerships all over China, and reportedly garnered lots of attention wherever they went. 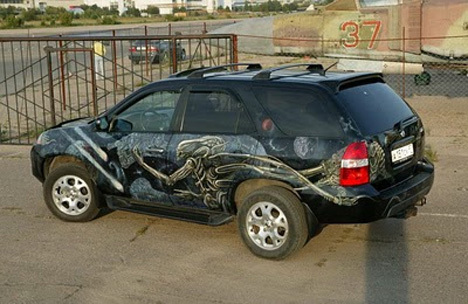 It’s hard to tell if this Star Wars car, first spotted on eBay in the beginning of 2009, was being sold because the owner was tired of never being able to get a date, or if the paint job was an ingenious plot to get way more for the car than it was actually worth. 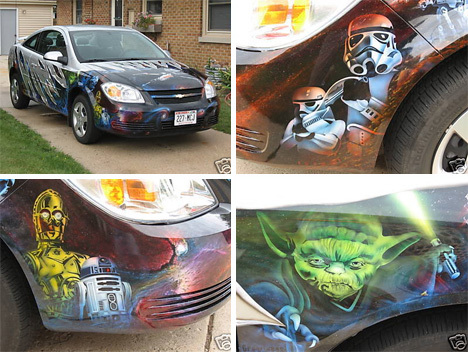 Either way, the 2007 Chevy Cobalt was painstakingly decorated over a period of four weeks and is now back up for sale on eBay – let the nerd-tastic bidding war begin. If Star Wars isn’t your thing, how about Alien? Compared to the car adorned with Yoda and the Death Star, this one looks almost sophisticated. 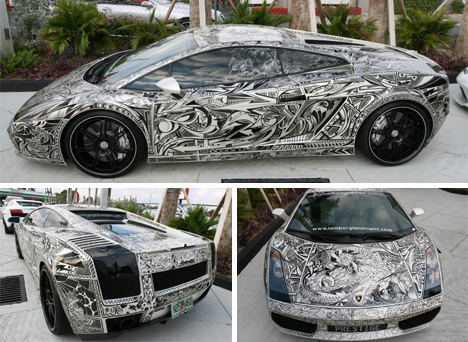 These beautifully detailed custom paint jobs look a little like Grandma’s wallpaper, but are definitely a great way to make your car stand out in a crowd. 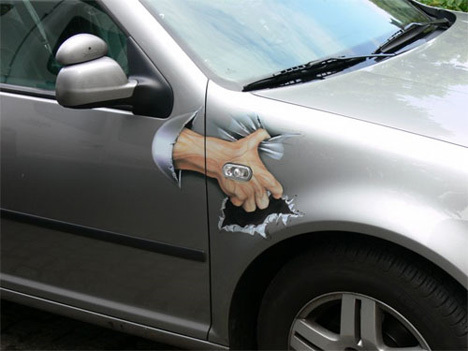 Adding a clever illusion to your car’s paint job is another way to customize it without going overboard. The top car, seen in Berlin, features nothing more than a trompe l’oeil hand reaching out to grab the fender like the passenger is holding on for dear life. The car below it, said to reside in Russia, gives a realistic view through the hood and into the engine compartment. Of course, if you do want to go all the way with an art car, you’d better make it count. 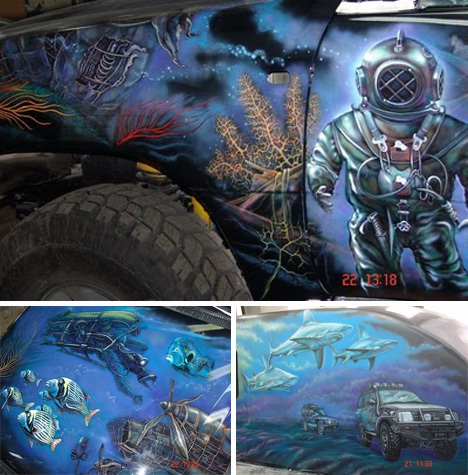 This underwater-themed car features striking graphics that undoubtedly make its owner very proud. See more in Art Vehicles or under Transportation. December, 2009.